For centuries, Russia has been the homeland of the Eastern Orthodox Church. And the country is home to a huge variety of religious architecture featuring this rich heritage and dating back almost a millennia. Our religious tour takes you on a tour of these religious historical sites and buildings. On this trip, you will visit the globally famous St. . Located at a distance of 70 km from Moscow in the town of Sergiyev Posad, this monastery is today the heart of Russian Orthodox Church and is considered the most important center of the Orthodox Church. Here you will actually get to meet the monks, see the publishing center of the Orthodox Church and visit a wide variety of cathedrals and other buildings stretching over a vast area. Most Russian religious architecture is recognizable by the beautiful onion domes. From the colorful onion domes of St. Basil’s Cathedral in Moscow to the white-and-blue domes in other towns, you will be able to explore the history of religious Russian architecture on this tour. Many Orthodox churches and cathedrals feature relics and images of saints in their own shrines. So you will be able to get upclose with these relics and other religious icons, many of them dating back many centuries. Many of the religious buildings are also home to historical artwork such as frescoes and murals going back to the medieval age. They offer a glimpse at the history of Russian religious art as well. On this trip, you will also visit the Church of the Holy Blessed Matrona of Moscow. 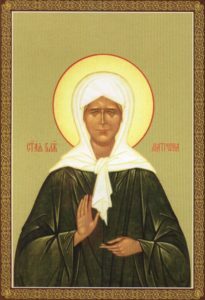 The Church commemorates Saint Matrona of Moscow who was spiritually gifted and healed countless people throughout her life. Let this trip help you explore the spiritual centers of Russia and find peace and calm in historical religious buildings. Our guide and translator will expert knowledge of Russian history. Culture will help you learn and discover many new things on this tour. For larger groups, of 3-4 persons or more, other costs apply. Travel by car or on foot, English speaking guide. The deep knowledge of religious life and the history of the Russian Orthodox Church are especially relevant.